Poly(lactic acid) (PLA), the first melt-processable synthetic fibre produced from annually renewable resources, combines ecological advantages with excellent performance in textiles. PLA successfully bridges the gap between synthetic and natural fibres and finds a wide range of uses, from medical and pharmaceutical applications to environmentally benign film and fibres for packaging, houseware, and clothing. Ease of melt processing, unique property spectrum, renewable source origin, and ease of composting and recycling at the end of its useful life has led to PLA fibres finding growing interest and acceptance over a range of commercial textile sectors. Our review of poly(lactic acid) (PLA) fibre is divided into two parts. Part I of this review gives information about production, properties, performance, environmental impact, and enduse applications of PLA fibres. The aim of Part II is to review the wet processing (pretreatment, dyeing, clearing, subsequent finishing treatments, washing, etc.) of PLA fibre and its effects on the fibre. These were accomplished through a broad literature survey, including recent research and development in the area. Published in Khimicheskie Volokna, No. 6, pp. 50-56, November-December, 2009. 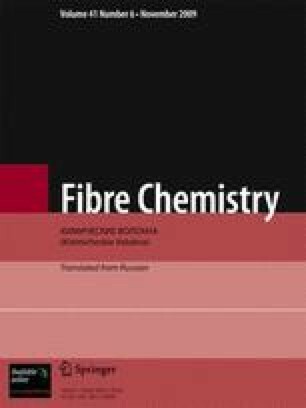 J. S. Dugan, Novel Properties of PLA fibers, Research Fiber Innovation technology, Inc, INTC 2000, Texas, USA, http://www.fitfibers.com/publications.htm, 2000. From Corn to Plastics. http://www.natureworksllc.com, Polymer Information, IngeoTM fi ber technical information, January 2003. Information from NatureWorks LLC, www.natureworksllc.com . J. R. Dorgan and D. Knauss, Environmentally Benign Polymeric Packaging Materials from Renewable Resources. www.es.epa.gov, Progress Report 2000.